PITTSBURGH (AP) — The Pittsburgh Steelers spent the better part of 10 months waiting on Le’Veon Bell to show up for work. They said all the right things, stressed they understood the star running back was making a business decision by opting to stay home in hopes of protecting himself ahead of a potentially lucrative payday next spring. And they’d welcome him with open arms whenever he returned. On Wednesday, with Bell’s absence for the rest of the season a certainty after he declined to sign his one-year, $14.5-million franchise tender , they exhaled. Bell’s teammates invaded his locker after practice, helping themselves to whatever they wanted — or at least whatever fit — with Bell’s career in Pittsburgh all but over. It wasn’t personal. Just business. A celebration of sorts to honor — they hope anyway — the last time they’ll have to answer questions about Bell’s unorthodox approach, one that included leaving his teammates in the dark about his plans. Something the first-place Steelers (6-2-1) are more than happy to do. They take a five-game winning streak into Sunday’s game at Jacksonville (3-6) looking for a bit of revenge against a team that beat them twice last season at Heinz Field, including a 45-42 stunner in the divisional round of the playoffs. 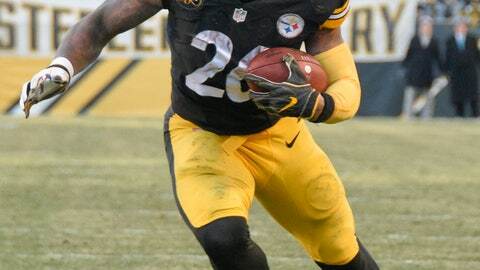 Bell finished with 157 total yards and two touchdowns in the loss. The Steelers cleaned out their lockers the following day, Bell among them. Despite saying he wanted to be a “Steeler for life” he never returned. Ben Roethlisberger attempted to reach out to Bell, texting him before Tuesday’s 4 p.m. deadline saying he hoped Bell would come in and sign. Bell never arrived and never responded to the quarterback he played alongside during the first five years of his career. The Steelers, meanwhile, will try to move forward without the versatile Bell, who played a vital role in the team’s run of four straight playoff berths. Yet they have hardly missed a beat thanks to the rapid development of second-year back James Conner. The former Pitt star is second in the NFL in yards from scrimmage (1,158 yards) and his 10 rushing touchdowns are already one more than Bell ever put up in a single season. Conner’s success, however, also put him in an awkward position. He considers Bell a friend — and while Bell did otherwise stay silent on Tuesday he did share an Instagram story that appeared to show him promoting Conner to make the Pro Bowl — and never wanted to be put into an adversarial position against a mentor. Those concerns are gone now. While Bell will spend the next four months getting ready to hit free agency in hopes of landing a contract that would make him the highest-paid back in the NFL, Conner’s goals are more immediate. He sat out the late portions of a 52-21 romp over Carolina last Thursday after being placed in the concussion protocol for the first time as a pro. Conner admitted he felt “dizzy” initially, but was cleared to return to practice on Wednesday and should be fine to face the Jaguars. And his team again looks like the class of the AFC North. While Bell’s absence caused a furor when he didn’t come in before the regular season began — as he did in 2017 — things have died down considerably over the last month. Going unbeaten since the start of October helps. So does having Conner look like a Pro Bowler in his own right. NOTES: The NFL flexed San Diego’s visit to Pittsburgh on Dec. 2 to 8:20 p.m. EDT. The game had originally been scheduled to kick off at 1 p.m. … The league also moved Pittsburgh’s game at Oakland on Dec. 9 from 8:20 EDT to 4:25 EDT. … RT Marcus Gilbert (knee) and DE Stephon Tuitt (elbow) did not practice on Wednesday. … Roethlisberger was given the day off, as is typical.